Just Engaged? Here’s a plan of action for stress-free wedding organisation. 1. Set a budget. And stick to it! Your wedding is one of the most important days of your life. It doesn’t need to cost the earth but weddings are expensive and the easiest way to add stress to wedding planning is overspending. So your first step is to sit down with your fiancé and family and work out who is paying for what, and set a limit that isn’t going to break the bank. The more comfortable you are with what you’re spending, the easier it is to enjoy the process. The key is to feel you are getting value for money whatever your budget. 2. Write a guest list and get a good idea of the sort of numbers you expect to have. 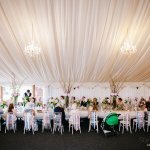 This can always change – you’re not sending out invitations yet but it’s important to know what you require from a venue before you start looking. 3.  Decide what sort of wedding you would like, roughly when you want to get married and where. 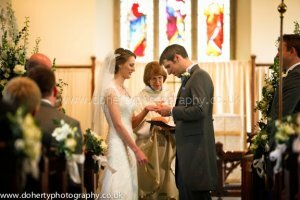 Do you want to get married in a church or would you like a civil ceremony? When you can get married may depend on your budget; if you need to save for the wedding then allow yourself time to do this. It’s good to have an idea of the time of year that you would prefer. The peak season for weddings is summer so this will always be the most expensive. Discuss with your fiancé what is important for you, for example: the possibility of drinks and photos outside in blooming gardens or a cosy winter wedding indoors. Set yourself a search area – big or small for a venue that is practical for you and your guests. 4. Find a wedding venue. 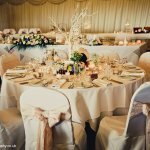 When you have a good idea what sort of wedding you would like and who you want to be there, the next step is to find a venue that caters for your requirements. Most wedding venues have websites with a lot of information; so you can research facilities, prices and often availability online. Make a shortlist of around four or five to go and see. More than this and you are likely to be overwhelmed, less and you won’t get a good idea of what’s on offer. Before you go for a show round, write a list of any particular questions you have that haven’t been answered on the website. 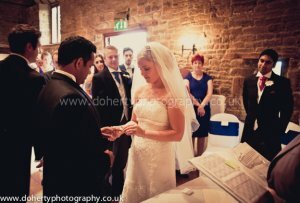 It is important that you come away from a show round with a good feel for the venue; whether you like it and can picture your wedding there or not. You also want to come away with an accurate idea of cost and a list of available dates. Make sure you know exactly what is included in the price and what you will need to provide on top. When it comes to making a final decision, use your head as well as your heart; balance what you can afford with what you love and you won’t be disappointed. 5. Book your ceremony time with the registrar or church. 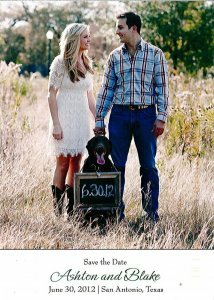 You can then send out Save the Date cards. 6. Relax and enjoy the process! The hardest part is done, so now for the fun bit. Once you have booked a venue and set a date, you can move on to the details which will really make your wedding day your own. Top of the list for the bride is to find a dress. Wedding dresses generally take six to nine months to arrive from ordering to having a dress fit for a princess (including alterations). The same goes for dress shopping as finding a venue: do your research online, work out what you do and don’t like and what you can get within your budget. Then go shopping. Book yourself four or five appointments ideally at shops that stock different designers so you can try as many different dresses on as possible. 7. Book your entertainment and photographer. Whether you are musical or not, no wedding is complete without a party and it is often the band and dancing that is talked about the most after a wedding. 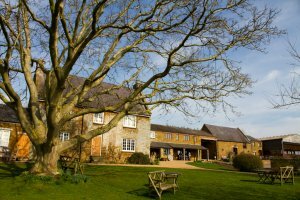 If you don’t know where to start, ask your venue for some recommended suppliers. They should have a list of reliable contacts for most things, band and DJ’s included and may be able to advise what would work best for your wedding. The same goes for a photographer. 8. Settle on a theme and decide on decorations. 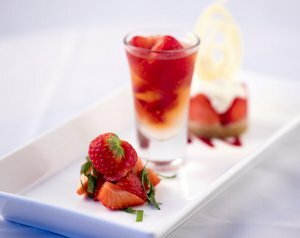 These should complement both you and your venue. 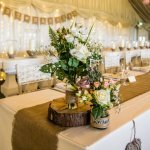 Tips on decorations can be found here: Decorating your Wedding Venue. 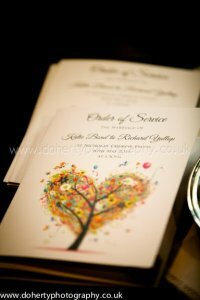 When you have settled on a theme, book any additional suppliers you may need such as a florist, chair covers and cake. 9. Choose bridesmaids dresses and ushers’ outfits. Finding bridesmaids dresses that you and your bridesmaids like can be a difficult task particularly if you have a lot of bridesmaids. Luckily, there is plenty of choice both on the high street and in specialist wedding shops. 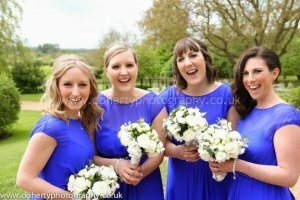 You will always pay a premium for a “bridesmaids” rather than a party dress on the high street, but the advantage is the availability of styles and colours. Sticking to one colour in a number of styles is a popular option. 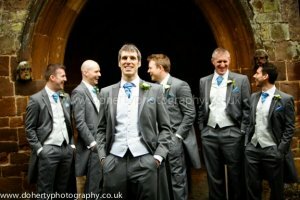 Choose your groom’s suit and ushers’ outfits. Again, you have the option of coordinating tie colours with your scheme and buttonholes too. It’s always great for the groom to have something different from the ushers. 10. Confirm your menu with the caterers. Food is another talking point at any wedding and even if you’re not particularly “foodie,” there’s nothing worse than a bad wedding meal. The “wedding breakfast” is your first meal together as husband and wife. 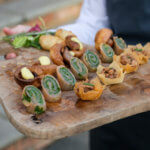 After the ceremony and reception drinks your guests will have built up an appetite so you don’t want to disappoint them! Many venues have one caterer that they work with and this is because they don’t want to quality of the food to reflect badly on the venue. 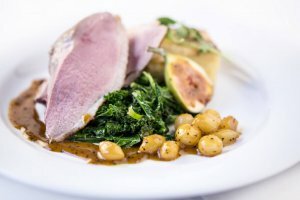 Even if you are tied to a certain caterer, it’s always good to talk to them before booking and make sure you’re happy with their style of cooking and of course, their prices.